Recent sales growth in electronic records management software is driving that shift, opening the door for Ray Morgan Company to leverage its past success selling copiers into an even brighter future. Electronic records management technology is cutting deep into the demand for the pulp products the copier industry is built on. Ray Morgan Company grew as copiers became every offices can’t-live-without-it tool. These necessities sat in the office corner and provided one simple, vital service: making copies. All that started to change as the dawn of the digital age turned the photocopier from a duplication device into an office’s information hub. Scarff started as a copier sales rep at Ray Morgan in 1996, around the same time digital copiers were introduced to the market. That’s about the time, Scarff says, Ray Morgan Company started to transition into a technology company. One of Scarff’s first decisions as the head of Ray Morgan Company’s brand new technology division was to partner with Long Beach, CA-based software developer Laserfiche. The organization was a pioneer of electronic document management software and helped make the concept of the paperless office reality through products that converted paper documents into electronic images. When Ray Morgan Company sales reps visited copier service accounts where filing cabinets were taking up too much office space, they would offer Laserfiche electronic records management as a solution. That same advantage has helped copier sales and service companies across the country to dominate the ranks of Laserfiche’s resellers, according to Laserfiche’s senior vice president of sales Hedy Belttary. Where some might view the digital document as a threat to those selling printing devices, copier sales and service businesses are increasingly capitalizing on a powerful technology helping its established accounts manage ever-growing demand for, and subsequent accumulation of, paper. Copier sales and service businesses make up close to 75 percent of Laserfiche’s resellers, Belttary says. But Laserfiche sales characteristically make up less than 25 percent of the average copier sales and service business’ revenue stream. That’s because digital document technology did not slow the demand for office paper after its introduction. A study recently cited in the Wall Street Journal shows paper demand nearly doubled from 1995 to 2012, dropping off briefly during the economic downturn in 2008-09. In that same time, Ray Morgan Company grew from a staff of 45 to a staff of 450 — achieving $100 million in annual sales and over 25,000 customers. 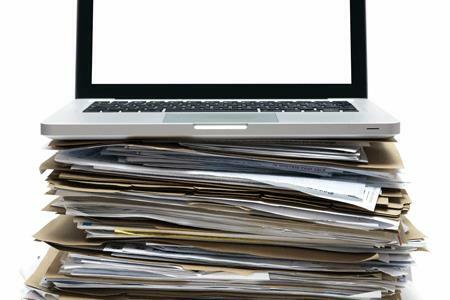 As the piles of paper grew, electronic records management has grown from a novelty to a necessity. Global sales of the software systems are expected to grow from $28 billion to $66 billion over the next five years. Despite the numbers, Scarff says Ray Morgan Company is not banking on software sales replacing the hardware in its 20 locations any time soon. The technology is, however, fundamentally changing sales strategies as the power of the digital document opens up a whole new way of working with office information. Electronic forms, business process automation, and records management capabilities are helping Ray Morgan Company customers save hundreds of thousands of dollars a year by eliminating the manual labor involved in handling, duplicating, and distributing information on paper. As the software is automating more and more aspects of office operations, the sales message at Ray Morgan Company has increasingly focused on educating customers on how much more the technology can do for them. That requires a savvier sales force, so a few years back the company started investing more time and money in training and improving its Laserfiche reps, continuing its path away from copier sales and into technology solutions. Where the old copier provided the same, very limited function, today’s multifunction printers are serving as the information gateway for paperwork coming into an office. For Ray Morgan Company customers, that gateway increasingly opens into a Laserfiche electronic records repository that enables organizations to leverage business process automation. While Ray Morgan Company’s largest customers may embrace the digital age, there are still many who rely more on paper than computers, Scarff says. Transitioning to digital means more than buying a faster, fancier copier; it’s a whole new way of running an office that many customers can be reluctant to commit to. But at the end of the day, the bottom line can change a lot of minds. Savings from business process automation can sway even the most skeptical mind.